A few years ago a friend of mine was diagnosed with a brain tumor. One day when she was talking about it, she quoted Einstein: "The only reason for time is so that everything doesn't happen at once." She believed she had a brain tumor because there was something for her to learn from it; because everything can't happen all at once, and, after some time, she would heal. "Holy Mother of God," I remember thinking, "I thought I was an optimist!" 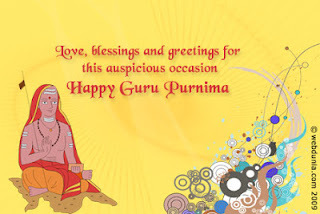 Today is Guru Purnima, a very important holiday on the Hindu and Buddhist calendars; it's held every year on the full moon in July to honor teachers. Some of us are lucky to have teachers, you know, other human beings who teach us stuff in a formal setting and if we have questions, we can ask them. Others of us may never find another human being who we really feel connected to in that way. I believe in something called The Guru Principle in which a teacher can be found in anything and everything. Today, one of my friends, Suki, talked about the teacher in traffic which reminded her to leave more time to get to where she's going next time. Someone may see a teacher in the flying ants that have moved into their apartment and finally take the time to fix the broken window. Or maybe the teacher is another person but in a less formal setting, like an angry customer or someone who is patient with their child. As today's holiday is a celebration of gratitude, I want to say thank you to all of my teachers everywhere. I would also like to continue to practice gratitude more than just a few times a year. I want to practice it in traffic, at the dentist, with flying ants and the lady who I think looks at me mean. I am grateful for my life, for my friend who had a brain tumor and I am grateful for right now.